Royal Caribbean has been experimenting with offering guests various drink package offers beyond the usual unlimited drink packages and on Oasis of the Seas this week, there is a 10 drink card offer that has been spotted. 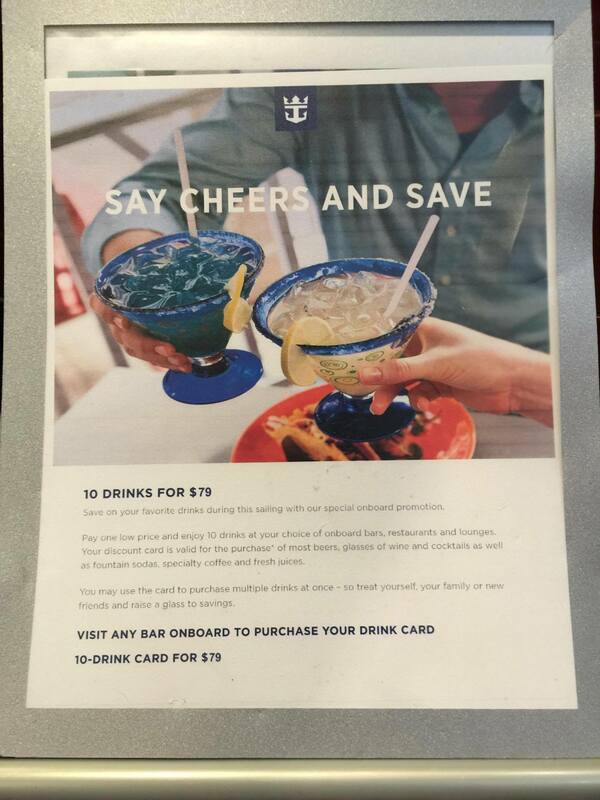 Royal Caribbean Blog reader Dan Kohout sent us this photo of an offer for 10 drinks for $79 on Oasis of the Seas. Guests can pay one price for 10 drinks at any onboard, bar, restaurant and lounge that is valid for the purchase of most beers, glasses of wine and cocktails, as well as fountain sodas, specialty coffee and fresh juices. We also received a report from Kris Leppien-Christensen, onboard Liberty of the Seas, of a similar offer this week, where guests can purchase ten drinks for $69. Royal Caribbean has been experimenting with these special offers over the last couple of weeks, with a one-day unlimited alcohol package on Enchantment of the Seas and a 10 drink ticket on Grandeur of the Seas. Royal Caribbean spokesperson Celia de la Llama told Cruise Critic, "Ships have been given the option to test different beverage package offerings onboard. The decision of which program to offer, if any, is made by the ship." Would you buy a drink ticket like this instead of an unlimited alcohol package? Share your thoughts in the comments!